Thomas Mawkes is a maker whose work I have come across several times over the years. There were two in fact, father and son, though it is a clock by the father I am concerned with here. He worked at Chesterfield and in the city of Derby; his namesake son worked later at Belper in Derbyshire. Not very much is known about him. There are brief details in Max Craven's book 'Clockmakers and Watchmakers of Derbyshire' but not much is known about him. Craven thinks he was apprenticed to John Whitehurst about 1754, but offers no evidence of that, though he does show that he worked for Whitehurst at some unknown period before 1777. If he had been apprenticed in 1754 that would set his year of birth at about 1740. Mawkes is an uncommon surname and the only Thomas Mawkes whose baptism I could find was born at Laneham in Nottinghamshire in 1733, the son of William and Mary Mawkes, which might just be him, though we have no way of proving it. He was married at St. Peter's Derby in 1769 to Ann Broughton. She might have been the girl of that name baptised at St. Werburgh's in Derby in 1741 the daughter of Gowen Broughton. But as far as my researches go Thomas Mawkes lived in a genealogical wasteland, for I can find little about him. We know that Thomas Mawkes was working in his own right, according to John Whitehurst, by 1777, when Whitehurst wrote of him. 'I have the idea of the utility an honest faithfull man must be to you. I mean one above corruption. Such an one is Thos. Mawkes, my late servant in the office. He is a married man, has two children and has gone to settle somewhere in the Countrey; at present is at Derby'. This is quoted from Max Craven's biography 'John Whitehurst of Derby'. Whitehurst says he was his former employee but does not actually say apprentice. This is an odd statement, that he is settled somewhere(unknown or unmentioned) in the country but at present in Derby, for Whitehurst must surely have known that by that date Thomas Mawkes had been trading in Chesterfield for many years. I can't understand it, unless he meant he was settled elsewhere but was now temporarily settled in Derby - and yet we know he sold clocks signed at Derby for some considerable number of years till he died there in 1821. This oak longcase clock of about 1780 by Thomas Mawkes of Derby is crossbanded in mahogany and looks very conventional for an early round dial type, which was especially popular in Derbyshire. But it reveals a few unexpected features. Click for closer view. We do know he worked for some years at Chesterfield, as his earlier clocks, (all brass dial ones?) are signed there. Oddly enough there were earlier Mawkes families living at Chesterfield, perhaps relatives, and Chesterfield is much nearer to Laneham than Derby, if that is where Thomas did come from. Craven says he had four sons, Thomas, the second son, moving to work at Belper and William, the fourth son, succeeding his father at Derby from 1821. Did Thomas senior work at both Chesterfield and Derby all along, or move from the former to the latter by 1777, which might be what Whitehurst meant? The 1791 directory still lists him at Chesterfield, so perhaps Whitehurst meant that he had opened an additional premises at Derby by 1777. We don't really know but fortunately we know more abut his clocks than his life and an interesting round dial longcase clock by him is examined here. Round dial longcase clocks were popular in the Midlands in the late eighteenth century, more so there than elsewhere at this period. The influence of Whitehurst himself may have helped popularise them, as he was a great exponent of them and dated examples by him are known as early as 1761. I have heard it said somewhere that he thought round dials were the obvious form since the clock hands travelled round them in a circle. Well, we can't argue with that. But whatever attitudes were prevalent in the later eighteenth century it is a fact that today round dials are not the most popular style of longcase clock - for several reasons. Many have a plain single-sheet brass dial and, without the decorative spandrels of the square or arched brass dial or without the painted corners (and arch?) that make most painted dials colourful and attractive, these dials cans fail to please the eye. In longcase Regulators such austere dials might be thought highly suitable and befitting for the sober purpose of the scientific instrument that such a precision timepiece is. Some of Whitehurst's own dials have that Regulator look about them - fine for the scientific instrument enthusiast but not appealing today to the population at large. 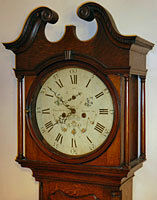 As a dealer I long ago learned to be very wary of round dial longcase clocks, which can be notoriously poor sellers. Some dealers with an unkind turn of phrase refer to them as 'a death in the trade', a phrase which cuts me to this day. I remember first hearing that said many years ago by an old-timer when looking scathingly at a very handsome arched-dial longcase clock I was so proud of but was struggling to sell. It had the arch filled to bursting in spectacular colour with a religious scene of some Old Testament character in billowing robes sacrificing his son to the Lord by slitting his throat with an Arabian dagger with a curved blade that made your knees sag on a rock shaped like a butcher's slab. The ladies were not at all taken with it and so I learned a bit about religion and a lot about the fickle tastes of the female mind. So, commercially, the only redeeming feature to such a round dial on a longcase clock is some form of fanciful treatment in the shape of engraved or painted decoration to relieve the tedium of a plain dial. The hood of this clock is of the best stylistic type in Derbyshire round dials, of which there are almost a dozen different treatments. The trick is to keep the shape graceful by setting the arch of the circle within the curve of the swan neck, not an easy thing to do successfully. Click for closer view. Round dial cases can also fail to please - a further reason many are poor sellers. Some round dial casemakers went very awkwardly about the task of fitting a round peg into a square hole. Some set off with the round set into a square, ending with a flat top, or a pitched (roof-top-shaped) pediment or with a swan-neck stuck on top of the flat, like an afterthought. The result can be very ungraceful and is one reason why many round dial clocks are unpopular today. Round into square doesn't go easily. The trick is to inset the round of the door glass shape into the upper section so that it goes half-way towards meeting the swan neck thereby making the round of the hood door an integral part of the shape of the overall curve of the swan neck shape. It is difficult to illustrate how well this works without showing several that don't. So a plain dial and an awkward case style can combine to make a clock type that I will stay well clear of when I look at such things, now that I too have the jaundiced eye of a long-time dealer. In this example of one of the earliest japanned round dials, Thomas Mawkes had the foresight to use a dial that was exceptionally well decorated and a casemaker who could keep a handsome line to the design. The movement is well made - how could it be other when made by a man who worked for John Whitehurst. Thomas Mawkes's clock and case avoid the pitfalls that beset many, so I have no quibble about this example. But I have a quite different bone to pick with honest Master Mawkes. The seatboards of almost all eight-day longcase clocks and a good many thirty hours ones were originally attached to the movement by means of seatboard bolts that screw from underneath up into the two lower movement pillars or by seatboard hooks that do the same thing by hooking over the top of the pillars and fastening underneath with nuts. This was a very sensible dodge as it makes the clock easily handled when assembling or when handling the loose movement for any other purpose. Many bolts have got lost or broken over the years and during restoration it is usually standard practice to replace any missing ones, to make life easier for everybody. There is nothing more irritating than struggling to handle an eight-day clock movement with a loose seatboard and two loose pullies all dangling loose at the same time in different directions, as disparate parts will do for someone like me with mechanical dyslexia. 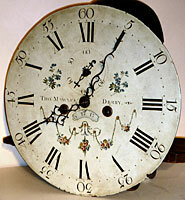 This dial is one of the earliest japanned dials, dating about 1780, the dialmaker unidentified, and using an unmarked falseplate to attach to the movement. Even in the unrestored state as pictured here, the dial can be seen to be exceptionally handsome with its delicate hanging swags of tiny flowers. Original blued steel hands. Click for closer view. In Derbyshire however, and certain other parts of the Midlands, it was customary for many makers to do what Thomas Mawkes has done here that is to set two metal spikes into the seatboard (probably just nails hammered in and with their heads removed) and to let the movement sit onto these spikes by means of holes in the pillars. This is rather like the seatboard bolt principle but without the screwthreads. Reluctant as I may be to criticise a craftsman of Thomas Mawkes's ability, I will do so anyway, as I find this a poor method. Maybe it worked for him at the time, but two centuries later I find this system a nuisance, even when both spikes remain unbent in their correct positions, as it still leaves you with the problem that, unless you are very careful, the seatboard drops loose taking the pullies with it. In this instance a typical failing is shown in the photographs in that one spike has been tugged out of its seatboard and sits uselessly in the pillar, leaving at best only one spike to do the job it was barely fit for in the first place. I am not a restorer and maybe those who are will laugh at this, but I don't think much of the seatboard spike system, and I must confess that when I send such a clock for restoration, I get the restorer to fit two new seatboard hooks. We can still leave Thomas Mawkes's spikes correctly in situ so that his mechanical artistry can suffer the judgement of posterity, but we'll make the movement so that even someone as mechanically kackhanded as me can handle it. No, it's not in my dictionary either but in the north we all know what it means and for those who don't it comes from the Old Norse word keikr, which means much the same thing.